“That means, something is lacking, something needs to be strengthened,” Pabillo added. The bishop said that around 1, 500 Catholic schools in the Philippines should make Christian and human values understandable to students. “(Catholic education should present) the faith more clearly to the people so they won't get the wrong ideas…Catholic schools (should) strengthen their (teaching of) educational values (so) that even if the president says something bad, they would not be emulated by people,” Pabillo said. "The approach (they) can do is clarity in the teachings...The communication (must be) holistic, not only addressing the mind but also the feelings… so they can live up to their convictions." He said. Meanwhile, a congregation leader and educator Rommel Lopez blamed the shortcomings of Catholic educators in particular for the propagation of anti-Church comments in social media nowadays. “This problem happened because of the failure of Catholic leaders in general and of Catholic educators in particular,” Lopez said, adding that there are “misinformed” Catholics who were being exploited by Duterte’s “operatives” on the internet. “The Church has abandoned the teaching of the faith. I have seen it personally...Ask any of the youth leaders about the basics of the faith and you'll get a smile in return,” Lopez added. It was also pointed out in the same article from Philstar that not attending Church regularly could weaken someone’s faith. “John (not his real name),” a 24-year old law student who studied in three Catholic institutions, believes that the teachings of the Church are not absolute.” The article said. “Because he does not regularly practice Catholicism anymore, “John” is not affected by the president’s tirades against the Church.” It added. ‘Education should be integrated with social issues’. “(Educators) need to form human beings holistically not just (their) cognitive development, skills, and formation of conscience,” he added. Alejo pointed out that theories taught inside the classroom will be useless if not applied in the real world. Religious affairs director of Angelicum College in Quezon City, Fr. Butch Bombase believes that education should go beyond theories. "Actions speak louder than words…This job of teaching values is a job of every Catholic, not only of the teacher of religion,” Bombase said. 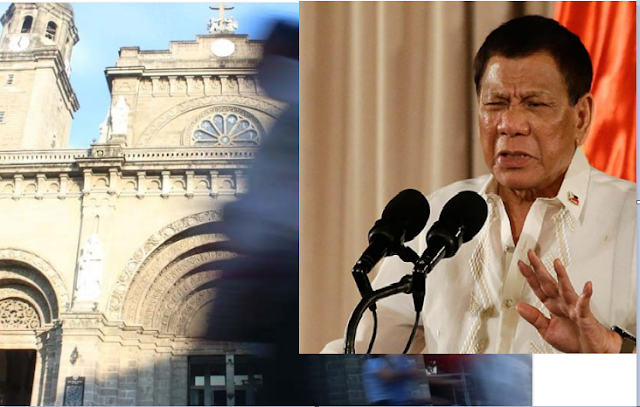 He stressed that deepening value formation in all institutions is the major key in countering the attack of Duterte against the Catholic Church. Bombase added that Duterte had criticized the Church for allegedly not helping the poor and the supposed unresolved cases of priests involved in sexual abuse. “We are not talking against Duterte. We are talking (about) the believers so they won't be lost,” he said. Meanwhile, Michael San Juan, who is a communications expert at De La Salle University, stressed that it is important for the Church to maintain its presence in social media platforms. “As long as they have an online presence, it’s okay. It’s fine. What’s more important is for the Church, for us, to go beyond social media platforms because it’s more important to convince people beyond social media… That’s where the real discussion lies,” he said.